A pier at Sanur beach, where you catch the fast boat to Penida. Justin and I spent two nights last week on Nusa Penida, an island off the south east coast of Bali. The crossing from Sanur to Penida takes around half an hour on the fast boat. Depending on the weather, it can get pretty bumpy - and a touch scary! Walking down the rocky shore to get on the speed boat. On the boat, ready to go! We'd heard that Penida was pretty undeveloped, with some people describing it as 'like Bali 30 years ago'. We were excited to check it out for ourselves. Looking up to the blue skies over Penida, surrounded everywhere on the island by lush tropical forests. Arriving in Penida, you can hire a scooter at the pier; there's no public transport or taxis - so this is a good option! There is one main road that that circles the island, taking you through thick jungle. The main road in Penida. Tourism in Penida is in its infancy, and there are only a few options for accommodation and places to eat. On the upside, the island isn't overrun by tourists. 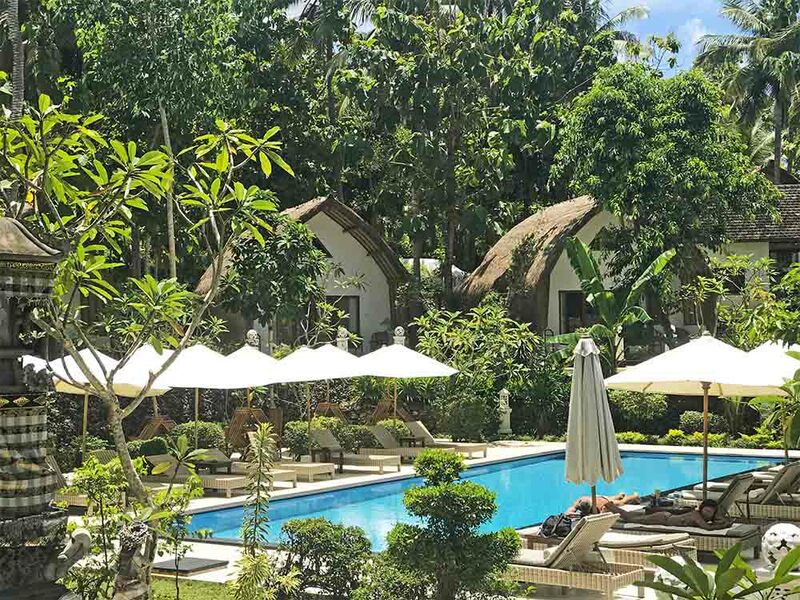 We chose to stay at Coco Resort, a lovely collection of villas handmade by local craftsman using local materials. The villas have been made in the style of a Lumbung, or rice granary, distinctive of traditional Sasak architecture. The villas at Coco Resort, positioned around their lovely swimming pool. Just a few minutes drive from Coco Resort is Crystal Bay, a beautiful white sand beach dotted with palm trees. We rented an umbrella and beach chairs and whiled away an afternoon here. There are vendors along the beach selling cold beers and light snacks. This fishing boat has been turned into a BBQ shack on Crystal Bay. Fishing boats moored in Crystal Bay. We wanted to look at a piece of land near Crystal Bay, which doesn't yet have road access, so we rented a local fishing boat to take a look at the land from the water. Off an a fishing boat to check out the coastline. Penida's natural beauty is pretty spectacular, and it's a popular place for scuba diving. We didn't dive on this occasion, but years ago we had an amazing dive at Manta Bay with huge manta rays - it was one of the best dives of our lives. This craggy island sits in Crystal Bay. We had cocktails at Sanctum beach bar, and a lovely dinner of fresh fish at Warung Jungle, an authentic roadside restaurant. We explored the coast on our bike, and found this beach just off the side of the road. We also went on a much longer drive, on a pretty rough road, to see Klungkung beach. It was a stunning sight, but too challenging to reach on foot down the cliff face. Next time we might try to reach the beach by boat! All in all, it was an utterly relaxing couple of days in an untouched piece of tropical paradise - something so special and rare to find these days. We enjoyed every minute. 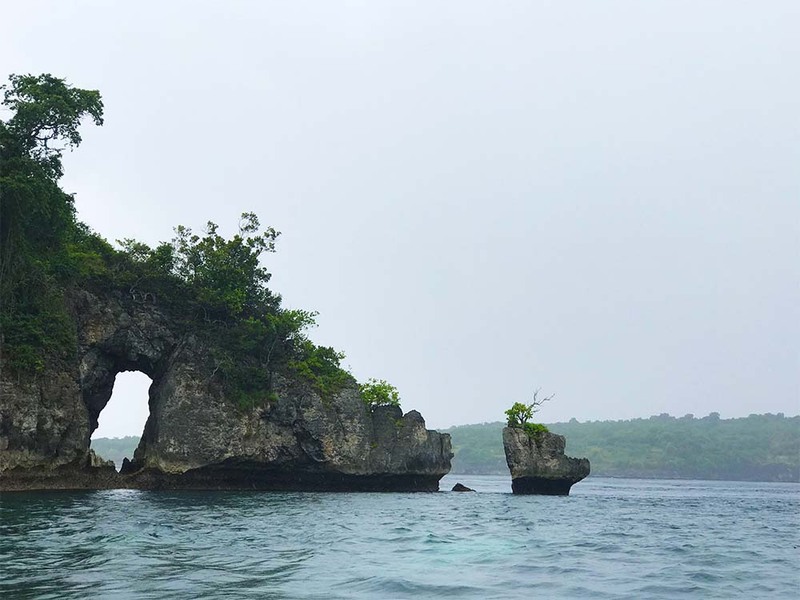 The spectacualor clffs of Nusa Penida near Manta Point. P.S. Nusa Penida is one of three islands off Bali's Southeast coast. Last year we visited Nusa Lembongan, one of the neighboring islands.